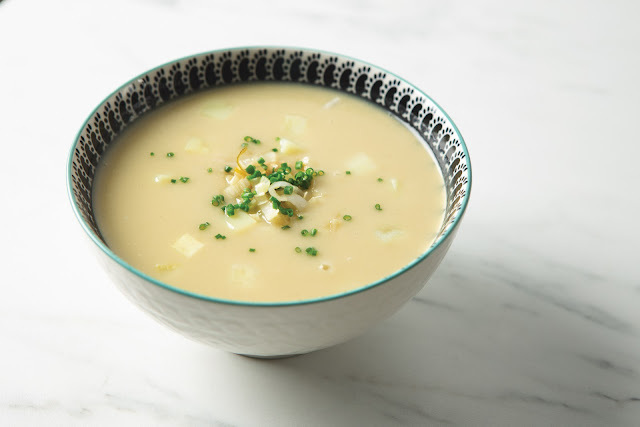 Combining all the earthy goodness of potatoes and the mild sweetness of leeks, this classic soup is delicious served hot or cold. Even better, the soup tastes better the next day. Small dice 1 cup of potatoes and boil in salted water until tender. Drain and reserve. Coarsely chop the remaining potatoes. Melt the butter in a 4-quart saucepan over medium-low heat. Add the leeks and cook, stirring, until tender, about 8 minutes. Reserve ½ cup for garnish. Add the onion and sauté until translucent, about 5 minutes. Add the coarsely chopped potatoes and white wine and reduce the wine by half. Add the vegetable stock and simmer until the potatoes are tender. Carefully pour the soup into a blender and puree on high until smooth and creamy, 20-30 seconds. Pour soup through a fine mesh strainer back into the saucepan. Bring to a simmer and season to taste with salt and white pepper. Stir in the heavy cream, if desired. Garnish with the reserved leeks and small diced potatoes.